Since December 2009 Palestinians and activists gather on Fridays in the Palestinian village of Nabi Saleh for the weekly demonstration against the colonization of Palestinian lands and the increase of the illegal Jewish-only Israeli colonies.Every Friday, demonstrators are met with violence from Israeli forces by teargas canisters being shot directly at demonstrators (which is against army rules of engagement), skunk truck spraying fowl water at high velocity (which is recorded to have injured protesters from the magnitude of force), pepper spray, violent arrests, attacks at civilian homes, sometimes physical beatings and more. However, every Friday, the demonstrators still carry through. On December 9th 2011, the demonstration turned fatal when Nabi Saleh villager and demonstrator Mustafa Al-Tamimi was shot directly in the head, by an Israeli soldier, with a teargas canister from a distance of a few meters. Earlier in December 2013, the Israeli military had closed the investigation into the murder of Mustafa (which was caught on camera)and concluded with no charges. The soldier that shot Mustafa Tamimi remains free at large and received no penalty whatsoever, as is typical of colonial regimes. In a similar incident, on November 19th 2012, Nabi Saleh villager Rushdi Tamimi was shot directly with live ammunition by Israeli forces. Israeli forces fired 80 bullets of live ammunition without justification that day. 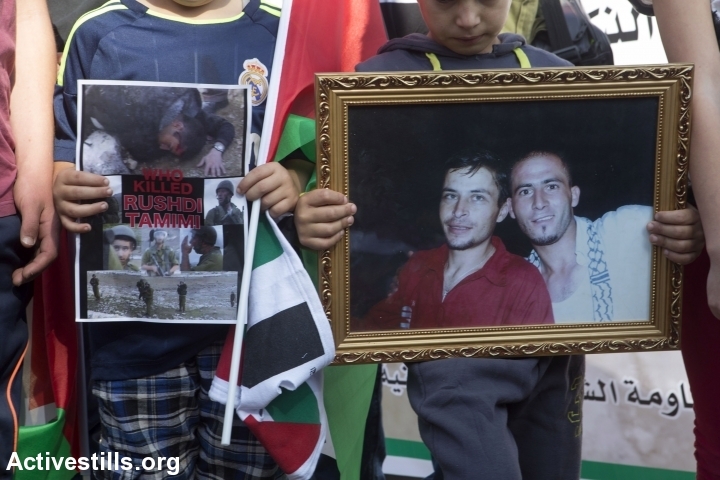 Rushdi Tamimi succumbed to his wounds two days later in a hospital in Ramallah. The commander that was in active duty when the incident occurred has allegedly been relieved of his duties as commander however remains free at large. Thus, no legal justice has been achieved in regards to the killing of Rushdi. On December 27th, 2013 Nabi Saleh villager Manal Tamimi was faced with a similar situation as Mustafa and Rushdi Tamimi. As Israeli forces raided the village with army and border police jeeps joined with the skunk truck, demonstrators attempted to stop them. The skunk truck went towards Sa’eed Tamimi’s house and began spraying the fowl water at a high velocity spraying the entire street and several homes, including the home of released prisoner Naji Tamimi. Sa’eed Tamimi a Palestinian prisoner in Israeli jails for 21 years is scheduled to be released on December 31st, 2013 alongside another 25 Palestinians that have been held since before the Oslo accords. According to the villagers, it had been six months since the skunk truck was brought in the weekly demonstration last. It appeared that the skunk truck was purposely targeting the street and home of Sa’eed just two days prior to his release. In attempt to halt the skunk truck from moving further into the village, three Palestinians defiantly stood in front of the skunk truck, motioning and chanting for it leave the village as Israeli forces are not welcome. The driver of the truck responded by spraying the Palestinians from head to toe with high velocity fowl water. The skunk truck followed by the two jeeps continued through going further into the village. As the skunk truck stopped by Bassem and Nariman Tamimi’s home, two Israeli forces got out of one of the jeeps and attempted to shoot teargas at Sa’eed’s home which housed a paralyzed woman as well as elderly and children. In attempt to stop the soldier from shooting, Manal Tamimi ran towards the soldiers shouting for them to get out and leave. The soldiers countered by pointing a gun directly at Manal Tamimi, and without warning she was shot with plastic coated steel bullets from hardly a few meters distance as shown in the video. According to the rules of the Open Fire Regulations there needs to be a minimum of 40 meters before shooting plastic coated steel bullets. Manal Tamimi states that multiple bullets were shot directly from close range and 4 of them hit her in the legs. Just like that day in December 9th, 2011 where Mutafa Tamimi was met with a fatal shot, Manal was shot in the same manner. The soldier that shot Manal will probably receive no repercussions just as the soldiers that murdered Mustafa and Rushdi Tamimi roam free. Manal Tamimi was fortunate enough to not have been murdered that day, whilst Mustafa and Rushdi Tamimi were not as fortunate.